Got that lady from Pulp City finished. Her name is "Hoodoo" and she is some kind of mixture between little Red Riding Hood and a Voodoo shaman. She also had a wolf but i did not want to paint that one up together with her. There will be a basing tutorial up soon on how i did the bog on this forest base. Hope you like her! Also i found this picture on my camera from one of Raffa's actual WIPs... Muh! 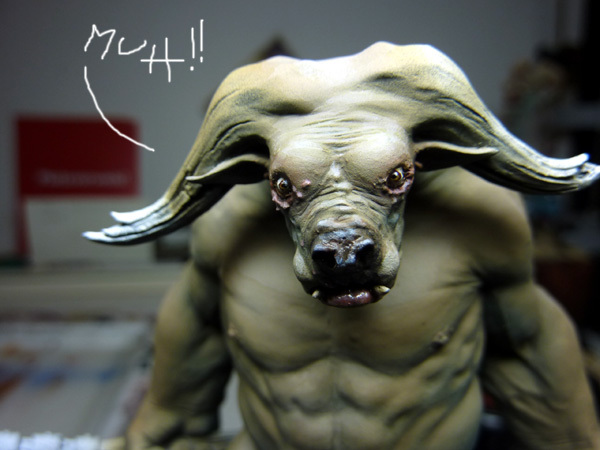 It is the Minotaure from Artefactory. WOW! Another cool figure. And the base work is just fantastic! The hoody girl is very very cool...and the base too! I've been following your blog for a while and I really like your style. Flawless technique, great colour schemes. This mini is no exception. I'm really amazed by the amount of minis that you paint on a regular basis, keep it up!